Yona Friedman, a big name in architecture, has created an installation in the countryside near Pescara, in the Italian region of Abruzzo that marks a kind of turnaround in the concept of architecture, telling us that in an overbuilt world, perhaps we should be building new images not new constructions. The output is “No Man's Land”, a creation standing on a plot of “no-man's land” where Land Art - the construction of a physical image in the territory - has been used as the medium to turn a plot of private property into something for the common good. A procedure that pursues the philosophy of webcreativity, since we are talking about the transformation of a surface to support a universal message, empowered further by the launch of a competition of theme images on Instagram. The work also responds to eco-sustainable criteria, starting from the materials used to create the work - for which Friedman is continuing to work with artist Jean-Baptiste Decavèle - and including the participation of university and school students involved in actually constructing the installation. 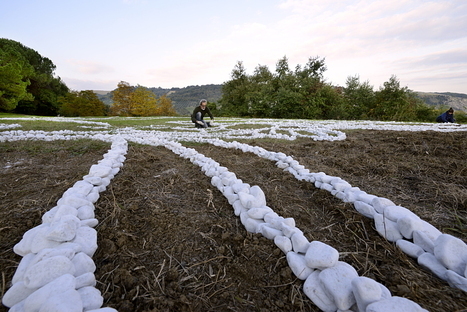 The result is a natural tapestry extending across two hectares, made of white river pebbles, a bamboo frame referencing Friedman's museum without walls and an imaginary dictionary that the artists engraved onto more than 200 walnut trees. These shape the countryside that is turned into something that can be used since it carries a new ethical and social message where Land Art is used to take back ownership of uncultivated, abandoned land. This is webcreativity at its best: if I can imagine something and my geographic other is able to decipher my image, then I have succeeded in communicating, as Yona Friedman and Jean-Baptiste Decavèle demonstrate with No Man's land. No Man's land is the output of these two artists together, the ARIA foundation, Cecilia Casorati - artistic director of the Foundation, the Zerynthia association and Mario Pieroni, who donated the land for the installation.